About a week ago, it was an absolutely miserable day in New York City. The sky was gray, it was raining on and off, and I just couldn’t get warm all day. It was probably the first truly dreary day this autumn, and I was in an undesirable mood. All I wanted was to go home and eat some leftovers but, as I made my way home, I just didn’t feel like eating the spicy sweet potato and black bean salad I had (although I had been enjoying it for lunch for several days now). Instead, I needed something hearty. I needed something warm. I needed chili… And I needed it bad. 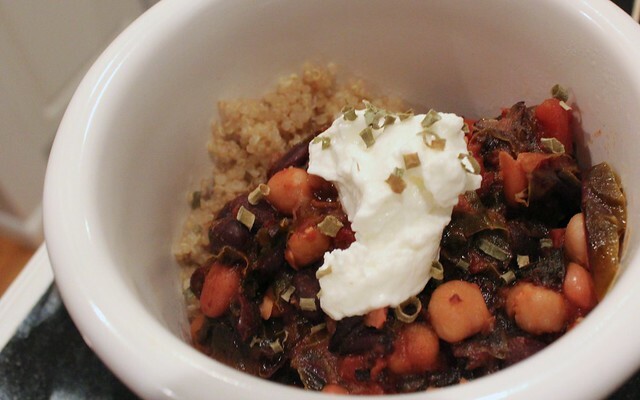 That’s how my crappy day turned into a great one, ending with a smoky three bean and kale chili that I topped with Greek yogurt and served over quinoa. I knew that it was going to take a lot to improve on this dreary day, and luckily this chili did not disappoint. First of all, to make a Latin-style chili, I started with my Cuban sofrito. Since it was already prepared, it was a much easier and quicker task to start cooking. If you don’t have any prepared sofrito, you can fake it by sautéing a chopped yellow or white onion for 5 minutes, then adding a chopped bell pepper and garlic, and sautéing for another 5 minutes, before adding the fire-roasted tomatoes that will be the base for your chili. 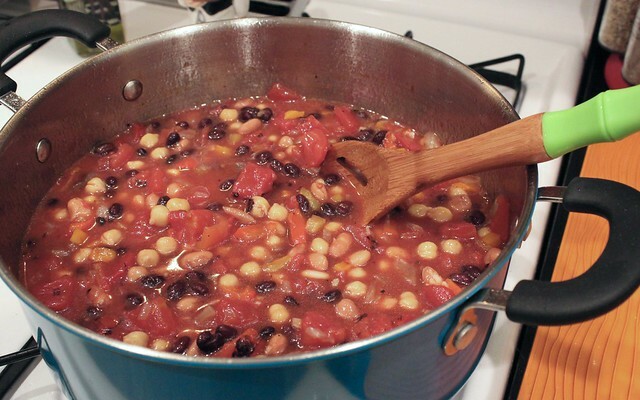 The next step in making a great vegetarian chili is the beans. I opted to use black beans, pinto beans and garbanzos because those are the ones I love. Black beans and pinto beans are pretty classic in chills, but the garbanzos are just a personal favorite. After losing weight and learning to eat more vegetables, I try to sneak greens in whenever possible. 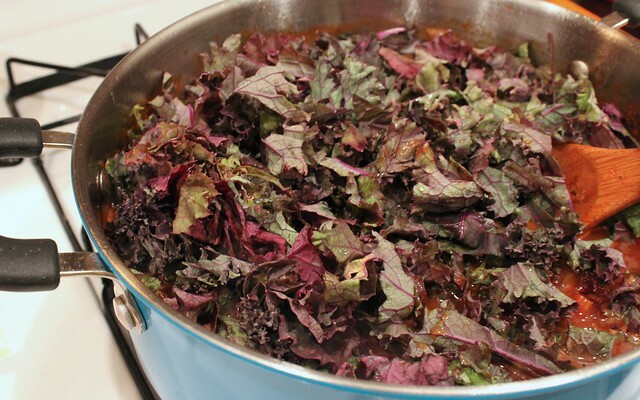 Kale has quickly one of my new favorites, and I couldn’t wait for the chance to add it to this chili. Whenever I find something fun to do with kale, I think of all of my friends who have said to me, “but I don’t like kale”, only to be proven wrong with one of my recipes. This time I was craving purple kale (also known as red kale), even though I’ve only had it once before. Adding in the dark, leafy green was a great way to get additional nutrition in this dish. In case you haven’t heard, kale is a nutritional powerhouse. It contains calcium, Vitamin A, Vitamin C, copper, potassium, iron, manganese, phosphorus and antioxidants. Doesn’t the chili look great? This was just after adding the kale and water. 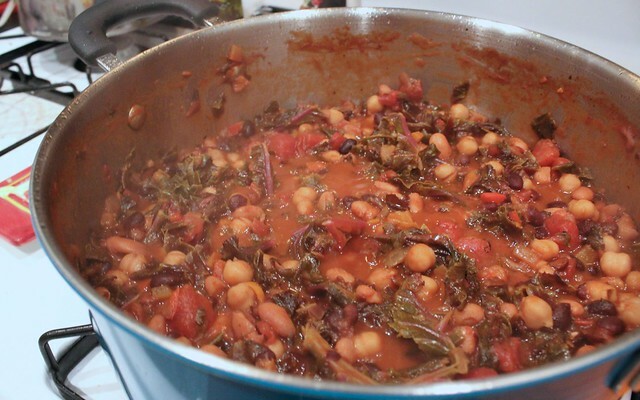 Along with the beans and kale, I added in plenty of spice to give it flavor. One of my favorite parts of cooking healthy is giving my meals a nice kick, either with spices or some of my favorite herbs, in order to make my good-for-you food taste great. It’s all about healthy eating and I sincerely believe that it should taste good. And trust me, this one did! Once I set my chili to a simmer, I started the quinoa in my rice cooker. There’s nothing easier than using your rice cooker, in my opinion, and adding a little extra dose of protein and whole grains thanks to the quinoa. It was just the best way to complete this meal. Oh man, it’s done! My smoky three bean and kale chili is done. I am excited! I admit: this dish warmed me up from the inside on that cold, dreary day. The best part is that it made quite a number of servings, and I’ve been enjoying it on other not-so-nice days ever since. I’m not ashamed to admit that, when it was horribly foggy this past Sunday, I reached for my chili again. It’s a dish that keeps on giving. There is nothing better than a heart-warming smoky chili on a cold day. This vegetarian version has plenty of protein and dark, leafy greens. If you don't have quinoa, serve with brown rice. In a large pot, heat the olive and coconut oil. Pour in the Cuban sofrito and sauté for a few minutes. 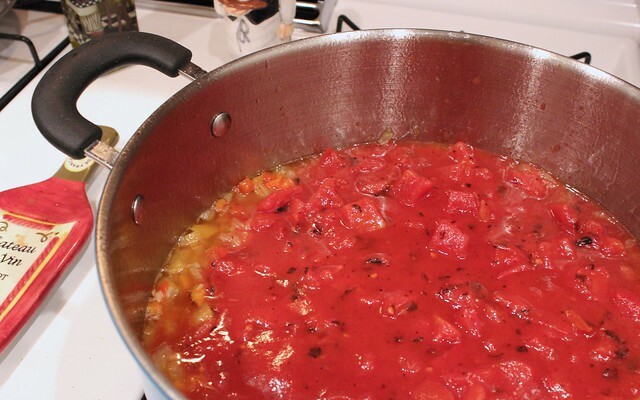 Add the can of tomato sauce and sauté for 5 minutes. Add in the black beans, pinto beans, garbanzo beans, the salt and spices. Cook together for 15 minutes, stirring occasionally. Finally, add the chopped kale and 1 cup of water. Stir the kale in and bring the chili to a boil. Lower the heat and bring to a simmer. Meanwhile, once you have set your chili to simmer, cook your quinoa. 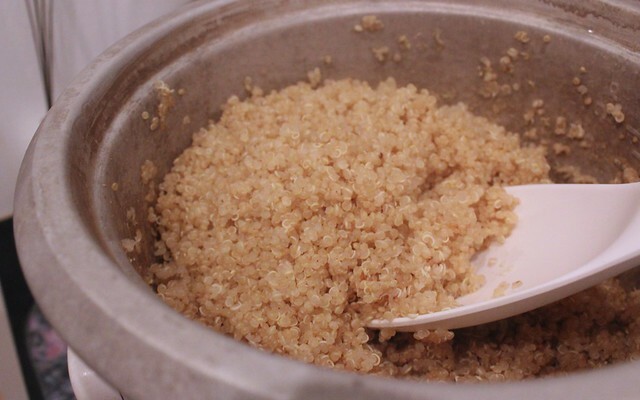 If you have a rice cooker: pour in 2 cups of quinoa and 4 cups of water. Set to cook. To make stovetop, bring 4 cups of water and the 2 cups of quinoa to a boil in a small pot, then turn off the heat and cover the pot. Let sit for about 12-15 minutes, or until the quinoa is done. As your chili cooks, make sure to stir and taste throughout. If you want it spicier, add in more of the powdered peppers. 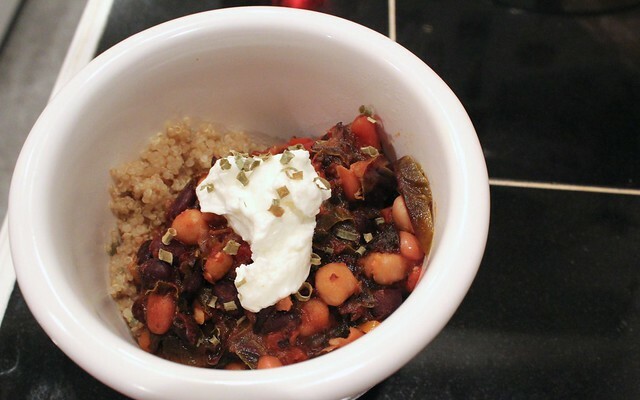 Once done, serve ¾ cup cooked quinoa with 1 cup of chili. Top with 1 tablespoon of Greek yogurt, then sprinkle with fresh or dried chives and serve. What is your favorite kind of chili to make on a cold, rainy day? 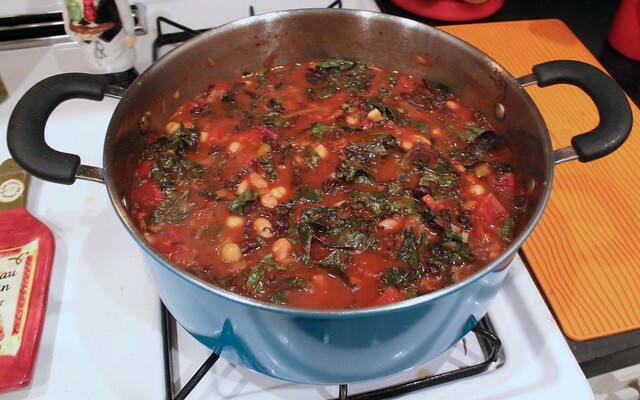 This entry was posted in Beans & Chilis, Gluten-Free, Spicy, Vegetarian, Whole Grains and tagged beans, chili, gluten free, kale, smoky, spicy, vegetarian by Irina Gonzalez. Bookmark the permalink.